New York (HJ) – In front of a busy Sunday saleroom and crowded telephone bank at Sotheby’s New York today, against a pre-sale estimate of US$300,000 - $450,000*, President Gerald Ford’s artificial leg was the subject of intense bidding between several American collectors and Scandinavian Royalty. After an intense bidding battle between at least three bidders; it was eventually sold to an antiquities dealer from Pittsburgh, PA who asked to remain anonymous. Mr. Kyle Deeds did state for the record that he was going to turn the leg, “…into a lamp or a hat stand. I hated President Ford.” The final bid for the artificial leg was $1.3 million. 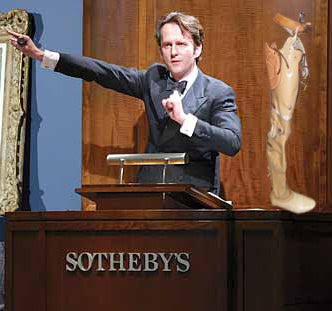 The price represents a new auction record for a Presidential artificial limb. Only one other Presidential Artificial Limb exists and that one is buried with President Gerald Ford. You seem to be forgetting James K Polk's artificial nose. Polk's nose was a baboon transplant which is technically not an artificial limb. What about George W. Bush's prosthetic head? Damned Scandinavians, always after our appendages. Some Conan wannabe is building a Hibernian throne of fake legs and hearing aids right now.